Illustrated by two-time Caldecott-honor winning artist Pamela Zagarenski, this tender, witty friendship story of imagination gone wild, by New York Times bestselling author Randall de Sève, shows how assumptions often cause us to misjudge—and miss out. But with a little courage, new opportunities and new friendships can be made. When Zola moves into the neighborhood, her new next-door neighbor is too shy to go over and introduce herself. 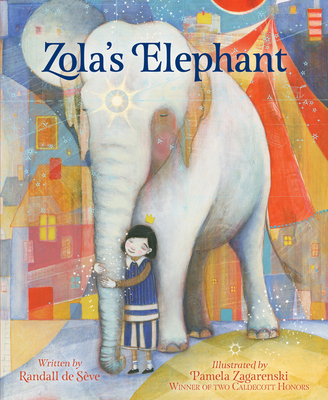 Plus, Zola already has a friend to play with—an elephant! What we imagine is not always true, as the little girl discovers. Luckily, she also discovers that being brave can lead to new friendships—and even richer imaginary worlds—in this heartwarming book about friendship, moving, and the power of imagination by New York Times best-selling author Randall de Sève and Caldecott Honor–winning illustrator Pamela Zagarenski. Randall de Sève is the author of New York Times bestseller Toy Boat, The Duchess of Whimsy, Mathilda and the Orange Balloon, Peanut and Fifi Have a Ball and A Fire Truck Named Red. Randall spent many fun-filled years teaching young children at Saint Ann's School in Brooklyn, NY, where she now lives with her husband, two daughters, a very wicked dog named Henry Biscuit, and his feline archnemesis, Cleopatra. She also contributes to Redbook Magazine online. Visit her online at randalldeseve.com. Pamela Zagarenski is the winner of two Caldecott Honors. The books she has illustrated have also been Booklist Editor's Choices, Horn Book Fanfare and Bulletin Blue Ribbon books, winners of Bank Street's Claudia Lewis Award, and translated into many languages. As well as illustrating picture books, she creates paintings and has a gift card line. She lives in Connecticut. Visit her online at pzagarenski.com, on Instagram @sacredbee, and Twitter @sacredbeez.